Frankenstein is a thoughtful, philosophical piece about everything from unrestrained ambition, the limits of scientific inquiry, the responsibilities of parenthood and the relationship between a creator God and mankind. It's also about a crazy scientist who makes a near-invincible murderous monster man out of corpses. What I'm saying is that there's a lot going on in Mary Shelley's Frankenstein. Now approaching its 200th anniversary, it's been lodged firmly in the public subconscious ever since its publication - the go-to comparison people reach for when they decide that science has overstepped the mark, or to simply describe the creation of something unnatural. Blackeyed Theatre's Frankenstein goes back to the source material, faithfully telling the tale as Shelley wrote it. This means no bonkers Dr Frankenstein yelling "IT'S ALIIIIVE! ", no Igor and no climactic crowd of pitchfork n' torch wielding villagers. Instead, we get the long build-up to Victor's (Ben Warwick) experiments,: including a spin-through of his childhood, his relationship with adoptive sister Elizabeth (Lara Cowin) and friend Henry (Max Gallagher), and the beginnings of his university education. It'ss a story that takes a while to kick into gear, only properly coming to life at the same time as Victor's hideous creation. But when it does, boy howdy it's great. Much is made of Victor's instinctive revulsion for his creation, echoed by the way pretty much everyone who comes into contact with the monster begins beating him up him and yelling abuse. This makes Blackeyed Theatre's decision to portray the monster using puppetry a stroke of sheer brilliance. Using the Japanese 'bunraku' style of puppetry, the Monster is a over-sized man-thing with thick ropey muscles, an Easter Island features and large, staring eyes. It's manipulated by whichever actors aren't currently in the scene and voiced by Louis Labovitch (the other actors pitch in at times of great emotion, giving its voice a weird choral echo). The combined effect is mesmerising, neatly inhabiting the uncanny valley and making Victor's reflexive disgust understandable. Despite his creepy appearance and unfortunate strangling habit, this monster is not entirely unsympathetic. Labovitch's wheezing, stilted delivery gives him a put-upon dignity, emphasising his victimhood and self-pity. There's something touchingly sweet in the way he peers around a tree, silently observing a happy family or reacts to taste for the first time. He does sometimes sound a bit like an undead Morrissey, moping about how it's unfair that everyone else is allowed happiness except him. But hey - if you were a hideous monster creature tossed naked into an unfriendly world you'd probably have a chip on your shoulder too. The monster is the obvious highlight, but he's buoyed by Victoria Spearing's evocative and malleable stage design. The sole piece of set is a chaotically nailed together knot of wood and fabric, which easily morphs between a polar ship trapped in the ice, the lightning blasted stump of a tree or Victor's scientific apparatus. Also making an impact is Ron McAllister's percussion heavy live score, punctuating the action with ominous bass beats or crescendoes of clattering cymbals. 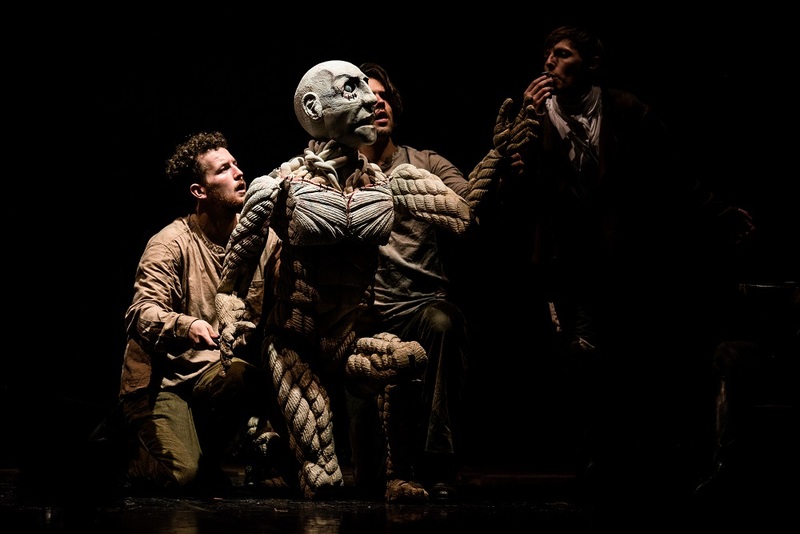 When all cylinders are firing Frankenstein is gripping stuff, sweeping the audience up in the magic of watching something that shouldn't be alive walking, breathing and talking, all enveloped in a heady fug of neo-Victorian stagecraft. It only comes slightly unstuck in earlier scenes, in which you find yourself silently urging Victor to put away his books and whip out the bonesaw and sewing kit. Regardless, this production is a visual marvel and successfully grapples with the meat of Shelley's story. The undoubted star, as tends to be the case with productions of Frankenstein, is the monster himself. Blackeyed Productions have created a thing that's neither living nor dead, but something else - something guaranteed to send a chill up the spine of even the hardiest theatregoer. Frankenstein is at Greenwich Theatre until 11 February, then on tour. Tickets and details here.